San Juan County Sheriff is asking for help locating 56-year-old Frederick Gabriel who went missing Sept. 15 near the Woodenshoe Trailhead, San Juan County, Sept. 23, 2016 | Photo courtesy of San Juan County Sheriff's Office, St. George News. Missing persons alert looking for 56-year-old Frederick Gabriel who went missing Sept. 18, 2015, near the Woodenshoe Trailhead, San Juan County, Sept. 23, 2016 | Photo courtesy of San Juan County Sheriff’s Office, St. George News. Update 4:25 p.m. Aug. 24, 2017. 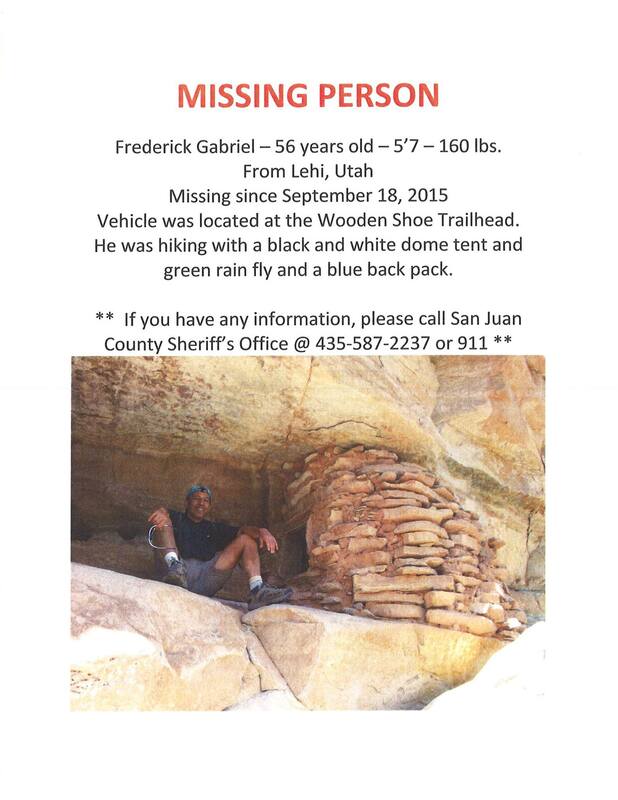 While the missing person case is no longer active, The San Juan County Sheriff’s Office still has a flier posted near the Woodenshoe Trailhead in hopes of finding Frederick Gabriel’s remains or belongings. SAN JUAN COUNTY — The San Juan County Sheriff’s Office is asking for the public’s help in locating 56-year-old Frederick Gabriel who went missing Sept 18, 2015. Gabriel, of Lehi, Utah, was last seen in the Woodenshoe Trailhead area west of Monticello, Utah. His vehicle was located at the Woodenshoe Trailhead. Gabriel was hiking with a black and white dome tent with a green rain fly and was carrying a blue backpack. San Juan County Sheriff’s Office at telephone 435-587-2237 or call 911.